The Procter & Gamble Company (PG) provides consumer packaged goods in the United States and internationally. This dividend aristocrat has paid uninterrupted dividends on its common stock since 1891 and increased payments to common shareholders every for 55 consecutive years. There are only eleven companies in the world which have managed to boost distributions over half a century. One of the largest shareholders is no other but Warren Buffett’s Berkshire Hathaway (BRK.B). The company’s last dividend increase was in April 2011 when the Board of Directors approved an 8.90% increase to 52.50 cents/share. Procter & Gamble’s largest competitors include Kimberly-Clark (KMB), Colgate-Palmolive (CL) and Clorox (CLX). The company has managed to deliver an 11% annual increase in EPS since 2002. Analysts expect Procter & Gamble to earn $4.23 per share in 2012 and $4.57 per share in 2013. 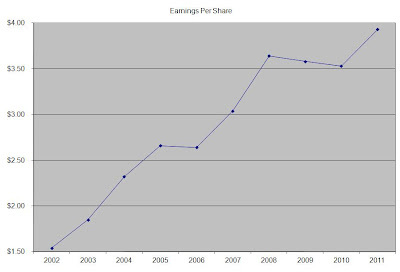 In comparison Procter & Gamble earned $3.93 /share in 2011. 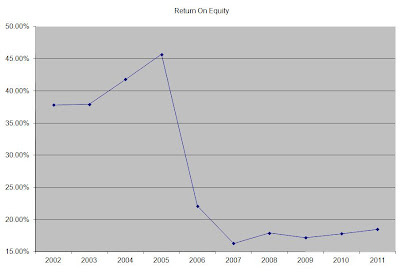 The company’s return on equity decreased in half when it acquired Gillette in 2005. This indicator has stabilized around 19% for the past four years. Rather than focus on absolute values for this indicator, I generally want to see at least a stable return on equity over time. The annual dividend payment has increased by 11.10% per year since 2002, which is equal to the growth in EPS. An 11% growth in distributions translates into the dividend payment doubling every six and a half years. If we look at historical data, going as far back as 1975 we see that Procter & Gamble has actually managed to double its dividend every seven years on average. The dividend payout ratio has mostly remained between 40% and 50%. Currently, it is just a little bit over 50%, but it appears sustainable. A lower payout is always a plus, since it leaves room for consistent dividend growth minimizing the impact of short-term fluctuations in earnings. Currently Procter & Gamble is attractively valued at 16.50 times earnings, has a sustainable dividend payout and yields 3.20%. I consider Procter & Gamble to have the qualities of a perfect dividend stock, that should be a core holding for any serious dividend investor. I would consider adding to my position in the stock on dips.